Messina is a cozy 30-seater restaurant a few minutes drive from Marbella’s Casco Antiguo that has been spoken of in hushed tones since they opened six years ago in a smaller location in the old town (what is now Skina). Their relocation to their larger modern space in 2005 was a significant move and brought about a change in the menu as well. We had been to Messina about a year ago to finally try what we had heard so much of and were satisfied with our meal but for one reason or another haven’t been back since. As it was our anniversary, we thought why not return to Messina and see what new things the chef have come up with for 2008. We arrived early for our 8:30 booking but had to drive around several times to find a parking spot. Upon entering. we were greeted by one half of the power duo behind Messina, Pia who operates the front of the house while her husband Mauricio is in charge of the kitchen. Surprisingly, she recognized us from last year and even remembered which table we had sat at (now that’s great customer recall!). 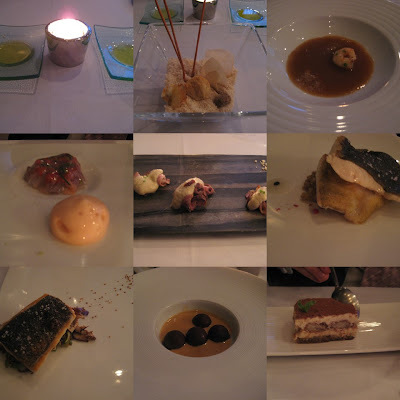 After seating us at a quiet table off to one side and taking our drink order, she came back to give us the metal-clad modern menu and the separate 8-course tasting menu (€55). We had decided ahead of time to skip the degustacion and go a la carte instead. The menu is split into four different sections – appetizers, pastas,meat and fish, and desserts. I decided on the duck to start followed by the wild sea bass while A had the ceviche to start and the turbot for his main course. Ordering over, we were served warm bread and two different gourmet olive oils to dip our bread into. This was immediately followed by a small teaser course which they call their “snacks” of square glass bowl filled with sand-like base and a few bites – several extra-thin grissini, a gougere (cheese puff), Gorgonzola in filo pastry, and three crisps – all stuck into the edible sand of ground almonds. It was a nice salty and crispy snack and a welcome alternative to just filling up on bread while waiting for the food to arrive. This was followed by an amuse bouche of their version of arroz caldoso (rice in broth) which was served in a bowl that had a mouthful of ground rice and a few shrimps with the hot broth poured onto the ingredients. The seafood- tasting broth was like a light shrimp bisque which was perfect to whet our appetite for the rest to come. After a short respite which we spent chatting with Pia about the restaurant scene in Marbella, our appetizers were brought over – the marinated duck with a smoked aubergine cream was excellent. Three pieces of thinly-sliced marinated duck breast topped with a tiny dollop of smokey roasted aubergine. It was a flavour mix that I had never come across and was a surprisingly delicious combination. My husband’s three-fish ceviche was also wonderfully seasoned and came with a scoop of foam that was made up of the ceviche’s own lime-based marinade. Main courses came soon after – my seared crispy-skinned sea bass came with mushrooms sauteed with slivers of wild spring garlic and was delicious. A‘s turbot was two pieces of soft fish atop a risotto of Quinoa and fennel. It must have been delicious because he ate it all and I never got to try it. For dessert, A had the tiramisu while I chose the banana bonbons with a warm dulce de leche soup. The tiramisu was as it should be – creamy Mascarpone and coffee-flavoured ladyfingers topped with lots of dark cocoa powder. My dessert was different – several chocolate-covered bonbons of caramelized bananas floating in a lukewarm dulce de leche sauce. Espressos came with them and while we were enjoying our last course, Pia’s husband, chef Mauricio, came outside to chat with us a bit and gave us the chance to compliment him on the wonderful dinner we just had. Messina is definitely going into my Black Book of Marbella restaurants – great food, a wonderful modern atmosphere and most importantly, personalized and friendly service from Pia and Mauricio who love what they do. Open Mondays to Saturdays for dinner from 8:00 p.m.